Katy Haye’s Rising Tides tells the story of Liberty 'Libby’ Marchmont, a citizen of City, one of the last bastions of known humanity in a flooded world. City floats atop the sea, cobbled together from remnants of the Time Before. Libby’s dad is City’s doctor, and she is training to follow in his footsteps. Things go sideways for Libby when a stranger from the Wastes, a reamer named Cosimo, shows up on their doorstep, requesting a specialised procedure requiring a licence to have performed. This procedure is something Liberty’s dad excels at - the making of a nautilus man by placing implants to function like gills when they go underwater. Following this illicit procedure, Liberty and her father are forced to flee with their patient. This is the first time Libby has been so far from home. She learns much of her dad’s past, and gets a lesson in humility and cultural acceptance when she must rely upon Cosimo for help in this vast new world. For his part, Cosimo is determined to find the land of sun and roses, believed to be a distant dry land beyond the vast floating garbage dump of the Waste. Libby’s story hooked me from the start, and kept me reading far into the wee morning hours. I just couldn't put it down! The pacing is swift and engaging. I love the bickering between Libby and Cosimo when they were fleeing City. Each from such different socio-cultural backgrounds, taught to despise the other culture from an early age, and having to let that conditioning go in the face of reality. Waterworld came to mind often. I love that movie. There’s a bit less of Mad Max Beyond Thunderdome than is present in Waterworld. City, at least, maintains a higher quality veneer of civility. I really enjoyed the concept of the nautilus men. They sound fascinating! It would be so neat to breathe safely underwater. 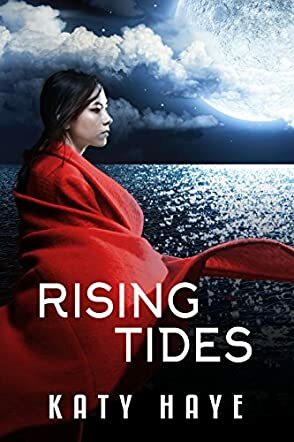 If you enjoy post-apocalyptic/ELE stories of a grim and distant future, if you enjoyed Waterworld or Mad Max Beyond Thunderdome, I highly recommend reading Rising Tides by Katy Haye. Rising Tides by Katy Haye is an interesting young adult post-apocalyptic novel with an intriguing storyline and characters. In the novel, the world is covered in water and as far as everyone knows there are only three places left to live in – City, a floating town; New Eden, the last piece of land not far from City; and the Wastes, the territory of the reamers who are deemed unsavory people. Libby Marchmont is content to be a citizen of City and assistant to her father, the well-respected doctor. However, things change when Cosimo, a reamer, arrives at their door. To Libby’s consternation, her father helps the boy and doesn’t tell her why. That same night, things take a dark turn and Libby is suddenly forced to leave City with Cosimo. Her world in shambles and thrust in situations she never thought she’d be in, Libby begins to question what she thought she knew about City and everything else. This novel reminded me of the 1995 film Waterworld where most of the earth is under water, the surviving humans live on floating communities, and dry land is a myth. Though it certainly has similarities to the film, Rising Tides has its own compelling story that catches your attention and even your emotions. The main characters, Libby and Cosimo, are effectively imperfect and ultimately engaging. Though at first Libby seems too compliant with City’s rules and Cosimo a little unremarkable, they slowly grow and develop into the type of characters that you would start rooting for. The story flows at a steady pace and the post-apocalyptic world that Katy Haye created includes some cool and ingenious concepts that I liked. Overall, Rising Tides is an entertaining read. Katy Hayes knows how to write an enjoyable novel and I’m looking forward to reading more of her work. A floating island of only five miles in each direction, City was the world's last civilised city; a raft built from tin and plastic actually, but the only home Libby had ever known. Liberty Marchmont always felt like an outsider in City. Even though she was the daughter of the second most important man in City, for some reason, she never fitted in with her peers so she chose instead to focus on learning her father's craft. As her father's assistant, at just seventeen, she was a skilled doctor herself. From the moment she met her father's latest patient, Libby knew right away that something was up. Something fishy. He looked too young to be licenced for the operation and when he spoke, her worst fears were confirmed. This was against the law on so many levels and Libby could not understand why her father would risk everything for this boy. Suddenly they were on the run - father, daughter and patient - fleeing from the only home she had ever known, yet her father would not tell her why or where they were headed. And then there was only her and Cosimo left, on the water in the middle of nowhere. Her father, a doctor who could give people the ability to breath underwater, was an invaluable member of the City community. Who would want him dead and why? What other secrets about her beloved home was she unaware of? Katy Haye did a formidable job of delivering a compelling read with a captivating plot, vivid and engaging characters, and a profound message. The message in Rising Tides really hit home with me. Maybe this was because we had just celebrated Earth Day on which several world leaders had signed the landmark climate protection deal, but I found myself thinking that the story could not have come out at a more fitting moment. Through the reading, I kept thinking about the kind of future we are headed for if we do not take drastic measures to curb the damage we are doing to our environment. Katy Haye gives a peek into the kind of future we are headed for unless we change our ways, otherwise we too will soon be making reference to 'Time Before,' and Mother Nature's generosity that we often take for granted will be a distant memory.